Pleased you like the look of it! When I came back from my trip to Austria earlier this year I was totally blown away by the wines and felt so inspired to do this feature. Wonderful people and wonderful wines. What more could you ask for!? Totally agree! I have developed a real appreciation of Austrian wines! Even the simpler examples seem well-made. A new variety I discovered in a recent local Austrian tasting was Rotgipfler - delicious and appetising! I also enjoyed Pittnauer’s red blend. Not surprised you felt inspired! It was a while back and the tasting room then was small, I have no idea if it is still the same, we did get Hill of Grace and one of the few bottles I could bring back is still in my cellar and overdue to be opened the '92 version. At the time we found all the Shiraz tasted to be on quite an even plane a very good one but not a lot between Cyril Henschke and Mount Edelstone and Hill of Grace, was not so impressed with their other wines and they do a lot, but times change so I am sure Winechief will update us on the current state of play there. Cyril Henschke for those that are to young to have known was shot and killed by his wife in a controversial murder that everyone seemed to have an opinion on, but it hung over the winery for years. I should add that if anyone is going to the winery, it is well of the beaten track, and it is a track or was, no other winery’s near it so you need to prepare for a drive. Interestingly the first two wines to run out are both Henschke, my bet would have been on the Californian wines. Mount Edelstone (oldest single vineyard bottling in Australia if I remember well) was always on my bucket list and after much contemplation actually secured a bottle just before this ran out. It might be disappointing, but at least I.ll know first hand. I think the cali wines, whilst clearly having cult status, don’t actually review that well for the price. And the affordable PN is a dozen case which counted it out for me - I have a tiny amount of storage at home so generally buy in 6s for putting in reserves. You won’t be. I’ve had the 2001. Great wine. 2006 a better vintage. Should be drinking well now. Would love to know your thoughts. Think this is the oldest single vineyard bottling in Australia. Any chance TWS could stock some please? For some reason Langmiel has never been seen over here, I stand to be corrected on that, but when I visited the winery I was impressed it certainly was in the top five of those visited and had a very good reputation in Australia. We visited after Chateau Tanunda, but I see now that Two Hands, Torbreck, neither of which were there then, Elderton, Haan, Bethany all visited, are all next 'door. and even Penfolds have a cellar door operation there now, and others like Lehman , Wolf Blass etc, that’s why it is such a good place to visit. Judging by Henschke web site the tasting room is not obviously bigger than then, though it looks a bit different in lay out, oh and that awful white chippings Keyneton Road has been properly tarmaced. Saw the mailshot, and then this thread, and just couldn’t help myself - it’s a terrible compulsion; some Henschke and Neyen being squirrelled away in the members reserves… cracking start to the wine week. Happy Monday!!! The process of ordering and purchasing wine certainly feels addictive to me at times! I promised myself not to buy any more until at least November, but returning from Lidl with some more wine yesterday the other half noted somewhat ruefully: “This ‘not buying wine until November’ isn’t really working, is it?”. Erm, no. I tend to treat shopping like a military exercise - in and out under the radar with highly targeted strikes to minimise fall-out. But with wine, I’m like Willy Wonka and the Chocolate Factory. … or am I being an enabler, here?! Indeed, the mixed case I put into reserves this morning contains a bottle of it. Great! So I don’t have it on my conscience! It might be disappointing, but at least I.ll know first hand. I think - well, I’m 90% sure - that I tried it once, a few years ago. It was right at the end of a rather long evening of tasting in Bath and quite frankly I was three sheets to the wind by then, but the Mount Edelstone really stopped me in my tracks, a phenomenal wine. 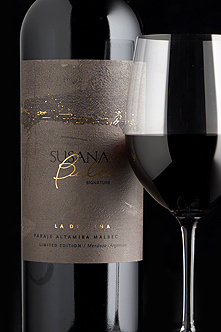 I do hope that the Society get their mitts on some more Susana Balbo Merlot. I bought some as a gift not so long ago and it was very well received. Not surprised it’s run out. It was great value when I first bought it, less so now. Just checked L&W again…the Euphonium 2004 is still on there…and still at quite a silly price. £96 a bottle.